Back in 2008-’09, I was perplexed that efforts to mitigate runaway global warming were occurring despite detailed opposition offered by skeptic climate scientists. Before my initial searches to find out why skeptic assessments were being ignored, I was unaware of how widespread the accusations were about skeptic scientists being paid industry money to lie to the public. Afterward, rather than finding multiple corroborations revealing massively damaging evidence of when, where and how the skeptics were paid to lie, all I found was one uncorroborated source for the accusation. When a journalist told me Ross Gelbspan was only one of many to expose the corruption, but wouldn’t point me to the others, I wondered if the accusation was actually independently corroborated. This isn’t rocket science, all that’s required is an internet search for the ‘crooked skeptic scientists’ accusation, then a look within the results to find out who the accusers cite as their source. 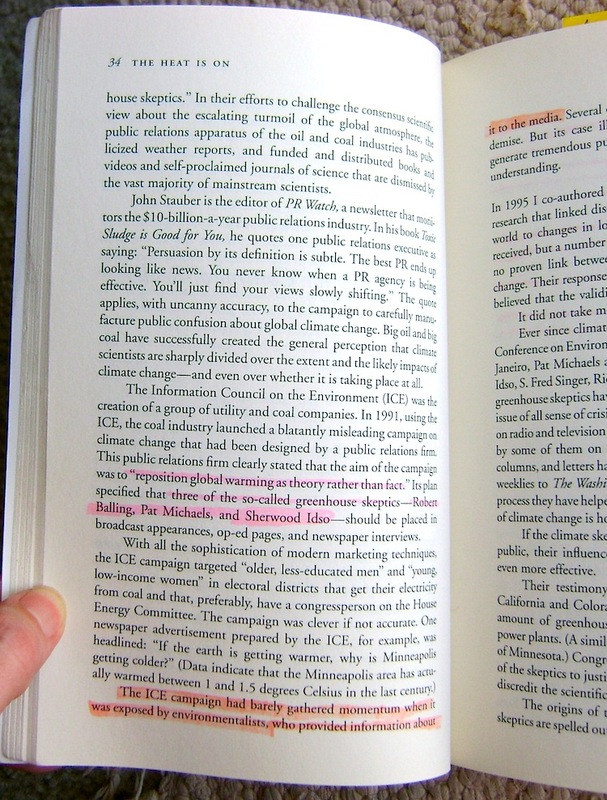 What I found in late 2009 almost always led me to myriad praise of Gelbspan as the discoverer of leaked industry memos containing the awkward ‘strategy’ phrase “reposition global warming as theory rather than fact,” which proved skeptic climate scientists were on the payroll of ‘Big Coal & Oil.’ A Seattle Times article said as much in a single sentence. 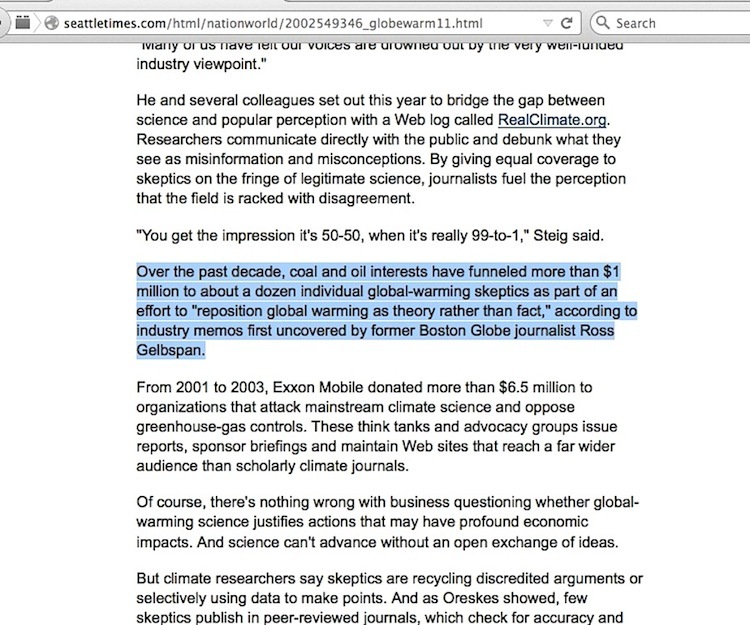 But I also ran into an immediate irreconcilable difference: a New York Times reporter clearly showed the same awkward leaked memo sentence four years prior to Gelbspan’s first mention of it, while offering no proof that skeptic scientists misinformed the public under a pay-for-performance arrangement with industry people. There was one more problem. Although many quoted that ‘strategy’ phrase and a pair of directly associated ‘targeting phrases’ about “less-educated men” / “young, low-income women”, not one pointed straight to the verbatim memos containing them. I found them in Greenpeace archives after comprehending why a reference to the otherwise forgotten Ozone Action organization was important. It was obvious why Greenpeace didn’t draw direct attention to them. The collection was worthless, nothing more than a disorganized pile of pilot project public relations campaign planning documents with a mismatch of lettering styles giving the appearance that some sections didn’t belong with others. Worse, the supposedly sinister-looking “reposition global warming” phrase didn’t remotely resemble a top-down directive for skeptic climate scientists to follow. So, I began writing a series of online articles at various venues pointing out those problems, literally the only person linking straight to the verbatim Greenpeace scans for the next four years (an obscure blogger bizarrely failed to link to them in 2012, but that’s another story). 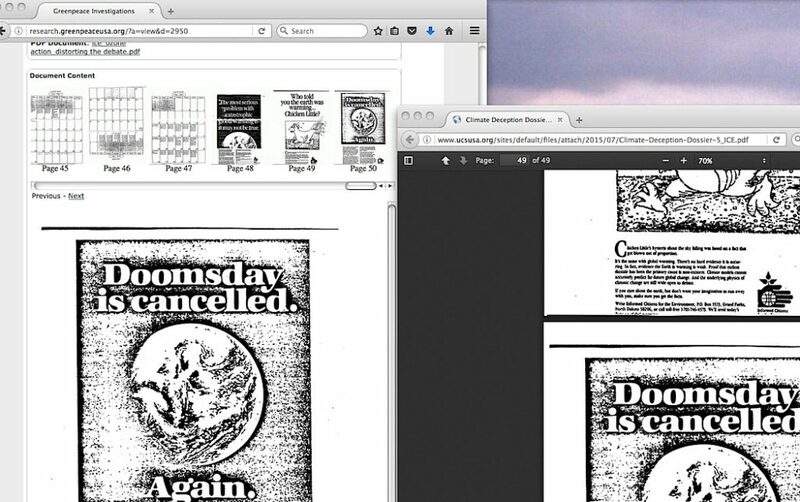 When the Desmogblog organization finally got around to linking to the Greenpeace scans in June 2013, it was shocking enough that I detailed it here. Shocking, because the co-founder of Desmog said he built his organization around the works of Gelbspan, and Gelbspan himself said (at the 8 second part of this audio interview) that he founded Desmog, yet from its early December 2005 start, nobody there had the courage to point straight to the scans for more than seven and a half years. 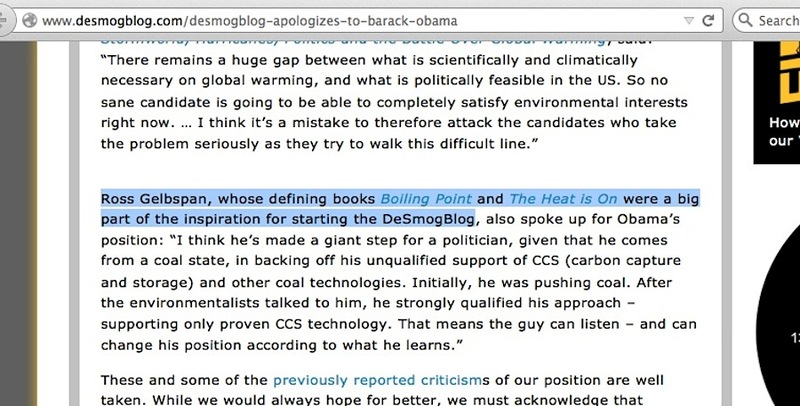 But the 2013 Desmog piece didn’t explain what led them to link to Greenpeace’s scans; not one word on why Greenpeace didn’t reveal the scans as a major news item back in 2007 when they were archived, not one word explaining why those scans were at Greenpeace when it was reported that the Sierra Club had them more than sixteen years earlier, … and not a word of why those scans have a cover page from some outfit called Ozone Action (lest anyone forget, when the Union of Concerned Scientists breathlessly ‘revealed’ those old scans in 2015, the reason their collection is only 49 pages vs Greenpeace’s 50 is because they simply erased the problem of the Ozone Action cover page). 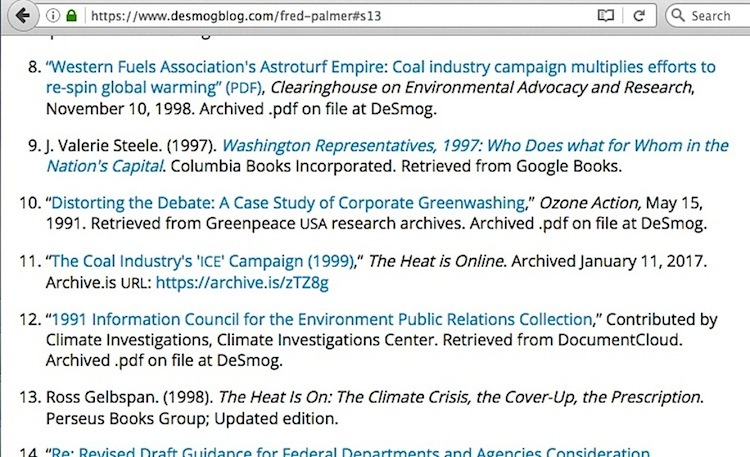 In a new entertaining development inadvertently reinforcing the problem that these memos are the only “smoking gun evidence” indicting skeptic climate scientists of industry-funded corruption, Desmog’s 1/29/17 piece trumpeted the arrival of former Western Fuels CEO Fred Palmer to the Heartland Institute ….. by linking to those old Greenpeace Ozone Action-sourced scans twice in the span of five paragraphs. 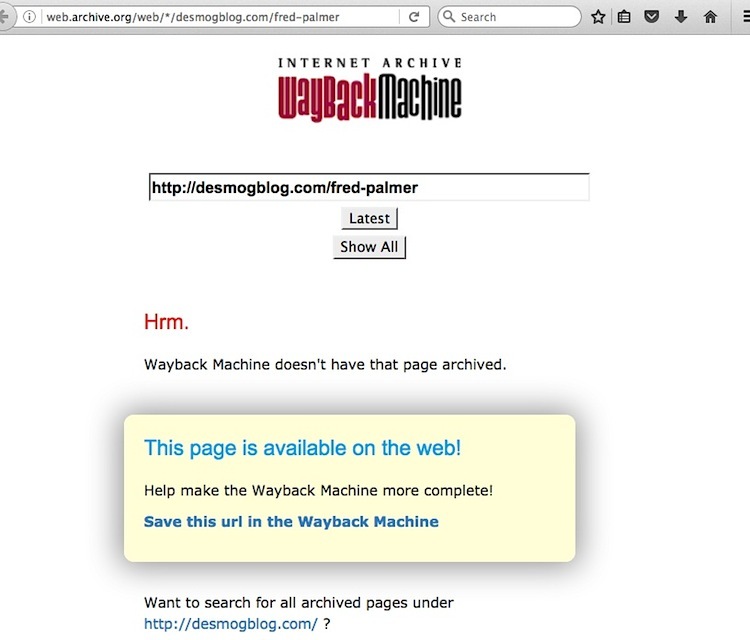 Desmog subsequently deepened the lack of independent corroborated problem with links and citations in what appears to be a hastily created profile of Fred Palmer (so new that it hasn’t been crawled yet by the Internet Archive, compared to the 2-time crawl already of their Palmer article, and the 62-time crawl of ICE campaign participant Dr Patrick Michaels). This screencapture is worth a thousand words (click to enlarge). 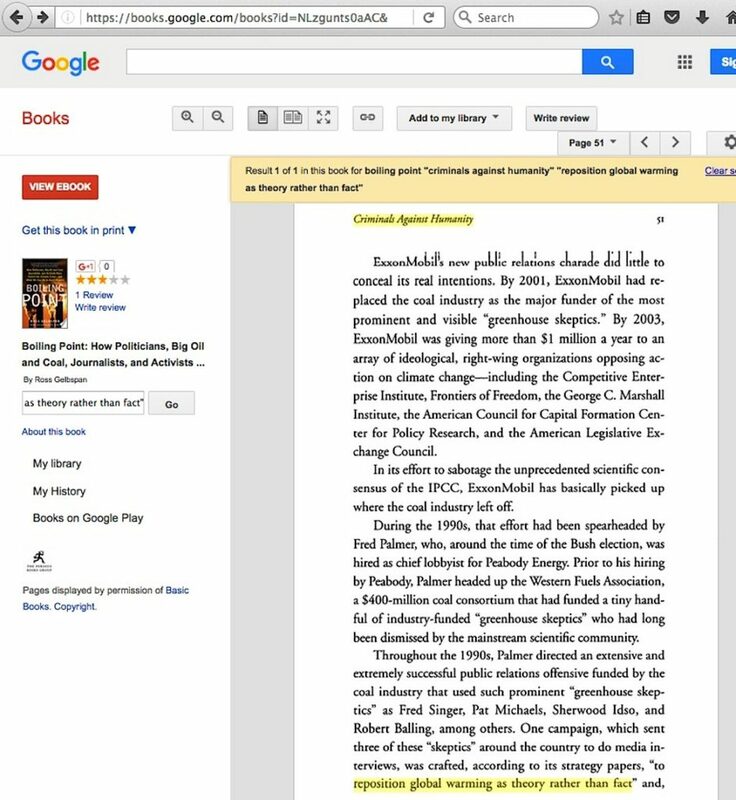 Where do the citation links lead to regarding the ‘Western Fuels’ leaked memos? 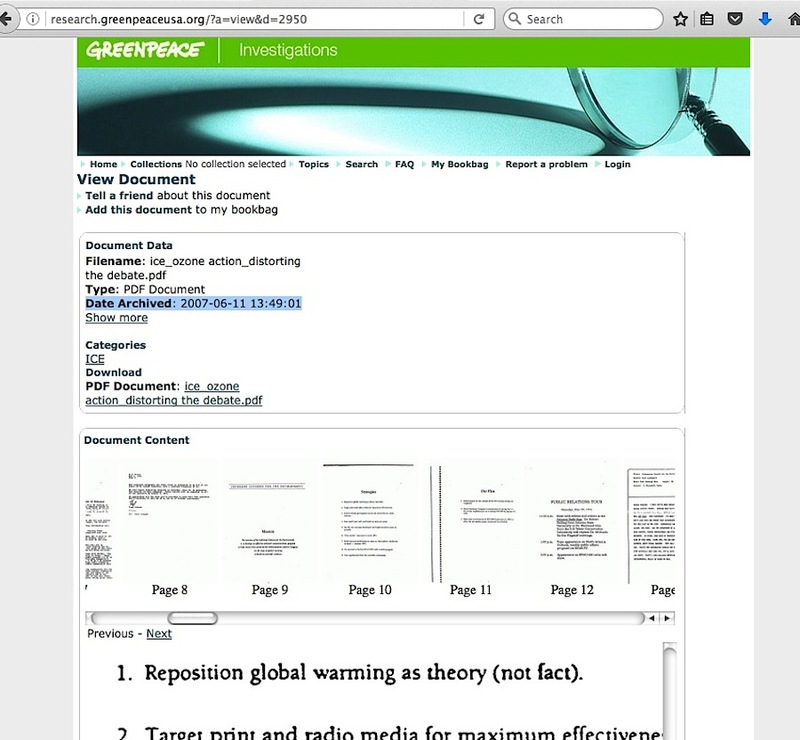 Numbers 10 and 12 go to the same old Greenpeace scans, ironically with #12 described as “additional ICE documents and print ads” (from the “Climate Investigations Center” – yes, the same outfit headed by that Kert Davies) despite being only 26 pages in length compared to Greenpeace’s 50 pages of scans. 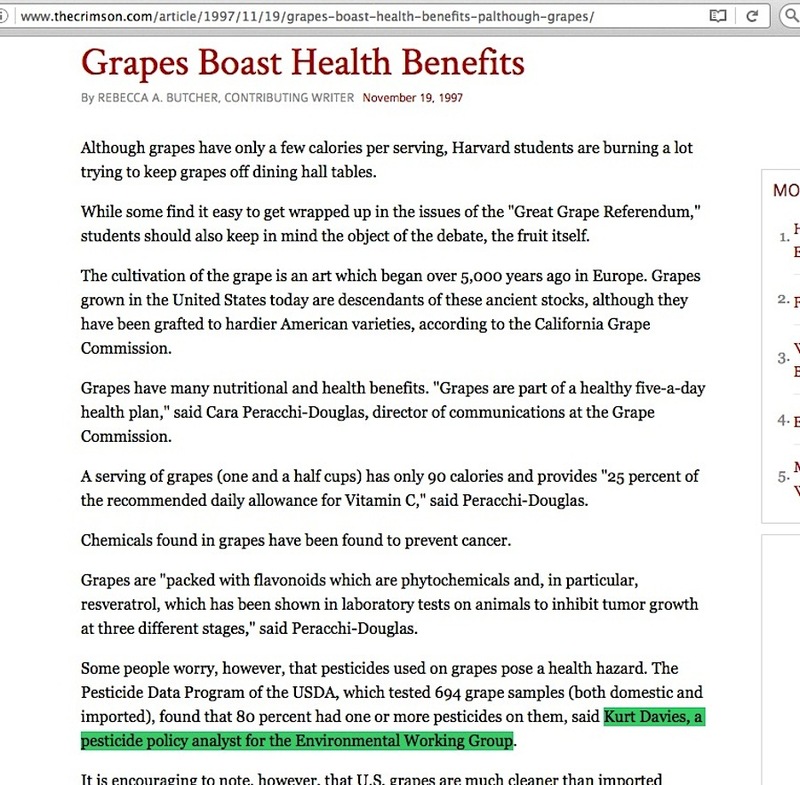 Footnote #11 goes to Ross Gelbspan’s page containing major errors on newspaper stories which supposedly shut down the ICE campaign, while #13 is for Gelbspan’s quotes of the leaked memo phrases which essentially made him famous (notice it is for his 1998 paperback, which buried the error about Fred Singer’s name in the 1997 hardcover). 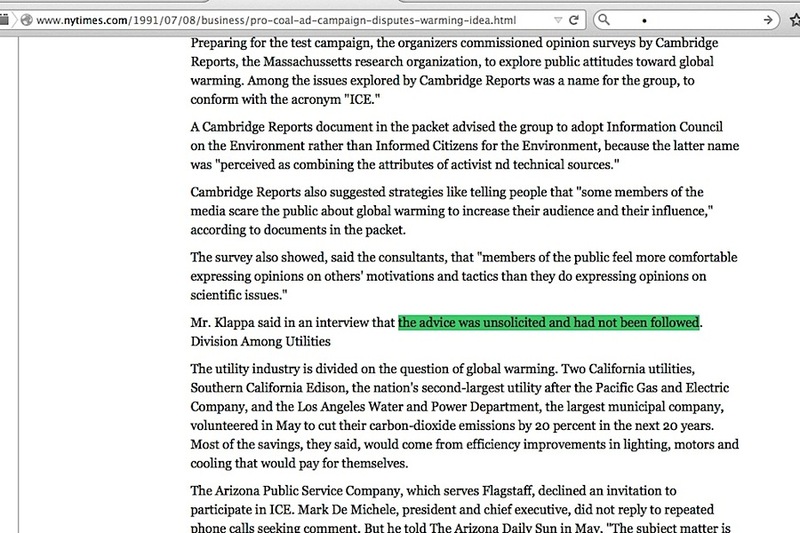 And finally, there is footnote #8, going to the the Environmental Working Group’s (EWG) Clearinghouse on Environmental Advocacy and Research (where Kert Davies worked before moving to Ozone Action) …… which cites Ozone Action and Gelbspan for quoted phrases out of the leaked memo scans. See the problem? 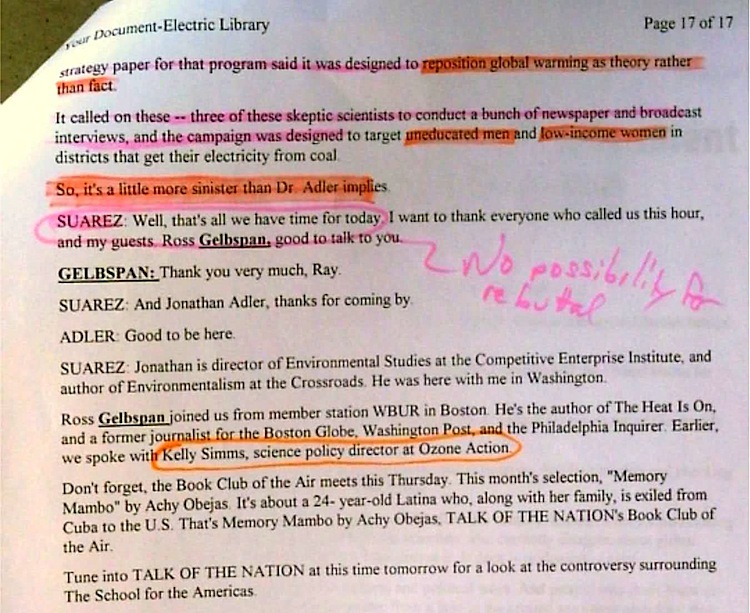 One set of particular memo phrases, and one person largely responsible for making them famous as a sinister top-down directive for what skeptic climate scientists’ goal and target was … but nobody corroborates his stories about the memos. Worst of all, Gelbspan never corroborated that the memo subset were actually part of the ICE campaign. 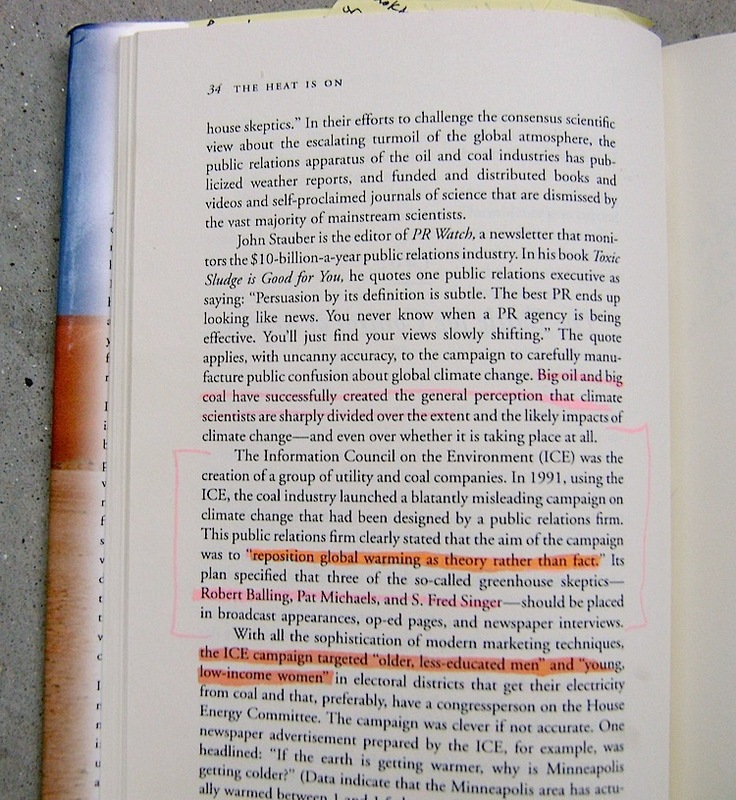 In late 2009, I asked four scientists routinely named as participants in it (exemplified by this then-current Wikipedia page dating from a year earlier) if they knew specifically of the “reposition global warming” memo; none did. Dr Singer said he didn’t even know what the ICE campaign was. In 2013, I asked a member of the advertising agency promoting ICE campaign and ICE’s media spokesperson whether the ‘sinister’ strategy/targeting memos were ever used in the campaign. Both said the memos were not, the latter telling me (if I recall correctly from our phone conversation) he wasn’t aware of that particular memo set, and the former saying in an email that he was aware of those “suggestions,” but that they were never used. The first nationwide news report about the ICE campaign contains a sentence noting how the suggestions of the memo subset were never used. Gelbspan also said as much, seemingly quoting from the Western Fuels CEO Fred Palmer. 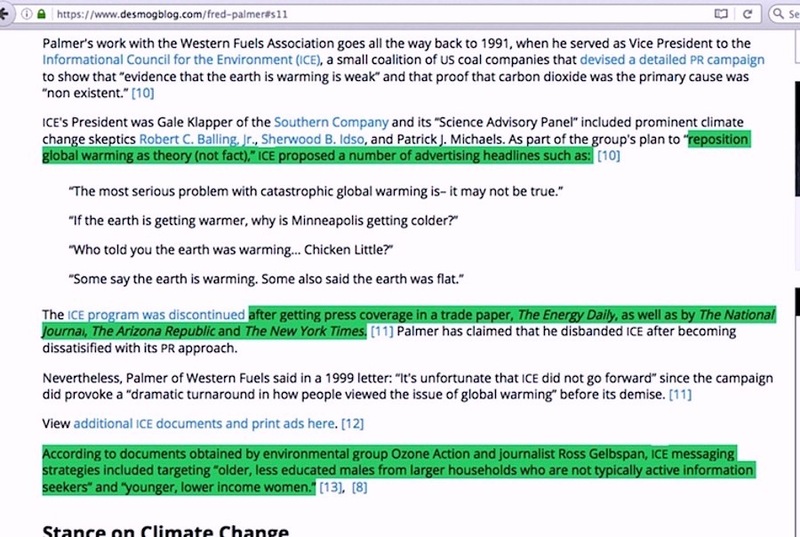 When I asked a senior level former Western Fuels employee about the infamous leaked memo subset having the “reposition global warming” phrase, he said he was aware of it as unsolicited suggestions, but it was rejected as not what Western Fuels had in mind for the ICE campaign’s goals or targeted audience. At my suggestion, article writer / researcher extraordinaire Ron Arnold undertook many interviews of officials associated with the ICE campaign and the source of that rejected memo proposal subset, resulting in his lengthy piece detailing how the subset was not only unused in the ICE campaign, but that the person overseeing ICE – Fred Palmer – never saw the proposal at all. 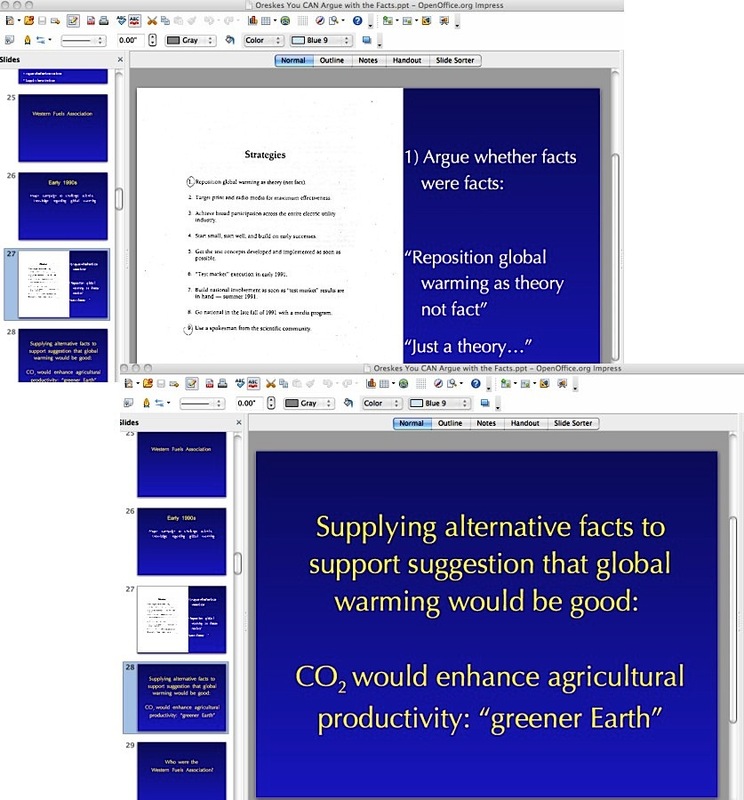 An elemental question begs to be corroborated in more than one way for sheer fairness: When the main pushers of the idea that the “reposition global warming” phrase insinuate it is proof of an industry-led disinformation effort employing crooked skeptic climate scientists — Naomi Oreskes saying it indicates a plot to supply “alternative facts,” Gelbspan saying it is a crime against humanity, and Al Gore implying it is a cynical oil company effort— are they truly oblivious to the necessity of corroborating whether or not that phrase and the memo subset it came from actually had widespread corrupting influence, or did they push this ‘evidence’ with malice knowing it was worthless? 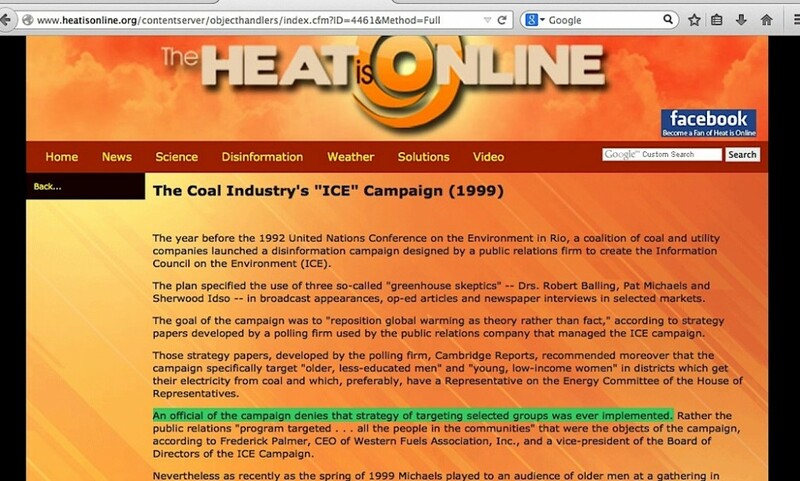 This entry was posted in accusation repetition, Information burial, Information Council for the Environment and tagged Al Gore, Desmogblog, Kert Davies, Naomi Oreskes, Western Fuels Association by Russell Cook. Bookmark the permalink.